This mural depicts a scene of the Sodus Point coal trestle during the late 1950s. 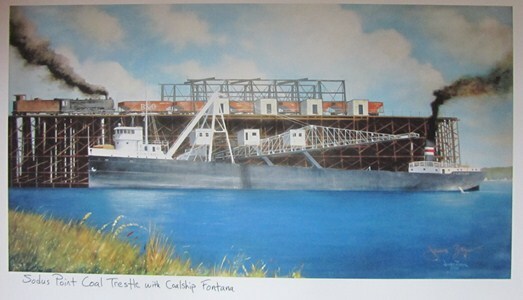 The large coal boat being filled with coal from the trestle in the mural is the Fontana which was a regular visitor. During its hey-day, Sodus Point was a central shipping point for coal, which was brought by rail from Pennsylvania. An immense loading dock or trestle was built on the west side of the bay, and bulk freighters from many Great Lake ports stopped to load up on coal, either to use as fuel or for industrial use, to ply up & down the Great Lakes & up north to Canada. Note the Fontana being loaded – it was 377 feet long yet is dwarfed by the trestle! The trestle was a chief landmark of Sodus Point, from its beginning in 1884 until it burned down in 1971. It extended 600 feet into the bay. Huge freighters docked daily for loading of Pennsylvania coal.